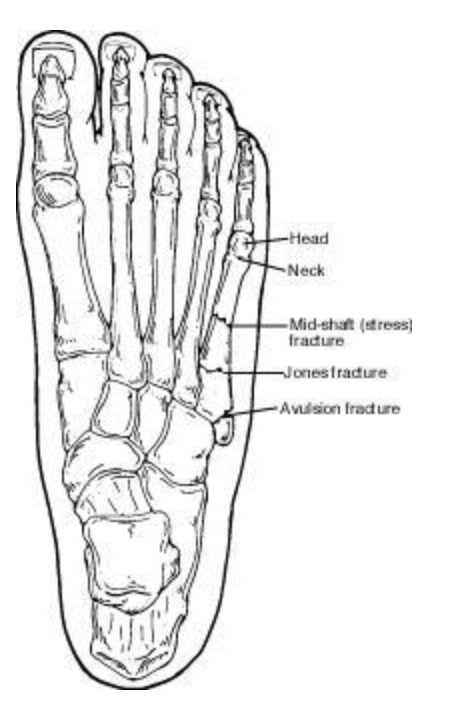 Avulsion fractures are very common foot injuries. There is quite a range of different potential injuries and scenarios. One example is a large avulsion fracture of the base of the fifth metatarsal. The peroneal brevis tendon attaches here, and the tendon is stronger than bone. Like with some ankle sprains and twisting of the ankle, the peroneal tendon is put under violent rapid strain including at its attachment site. And it pulls a large section of bone away from the rest of the larger bone–fifth metatarsal. On a smaller scale, other examples include where a ligament attaches to bone. For example the ligaments on the outside of your ankle. Or the ligaments that connect the larger heel bone (calcaneus) with the next bone (cuboid). The lateral ligaments over the calcaneal cuboid joint are also quite strong. With some foot injuries these ligaments are strained under tension, and rather than the ligament rupturing they pull a section of bone where they are attached to the larger section of bone (and it looks like a chip fracture). These larger chip fractures often can be seen on x-ray. Sometimes they are small enough and difficult to isolate that they are best seen with ultrasound imaging and can easily be missed with an x-ray. Therefore, avulsion injuries can involve a small or larger section of bone that is pulled and fractured. Again these can be diagnosed with an x-ray, fluoroscopy, ultrasound imaging, MRI or CT scan. Once they are diagnosed, the treatment is often a cast or cast boot to protect and immobilize the area. These can be treated similar to a bad ankle sprain or in some cases they are treated like a regular fracture. Because the avulsion fragment can be large and attached to the tendon, it can be difficult for this to reattach to the bone from the constant pulling of the tendon. If you have any injury that needs treatment or evaluation, or second opinion please let us know. Dr. Brandon Nelson and myself, Dr. Timothy Young, see and treat many of these injuries and have on-site xray, fluoroscopy, and ultrasound imaging.